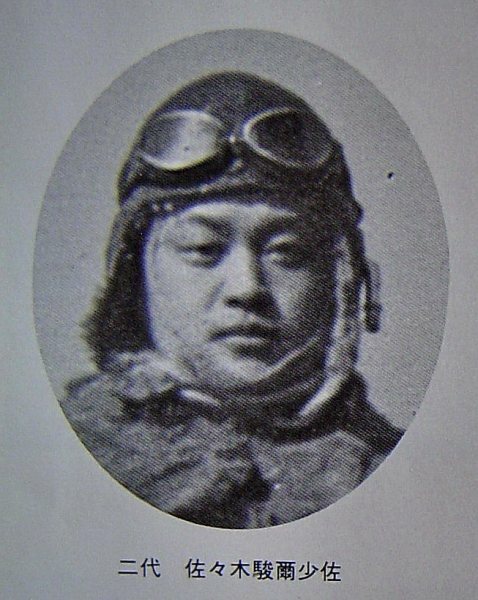 On 18th July 1943 the Mitsubishi Ki-46-II "Dinah", s/n 2414, of Dokuritsu 70th Hiko Chutai was shot down by Sqn Ldr Ken James, CO of 457 Sqn RAAF. 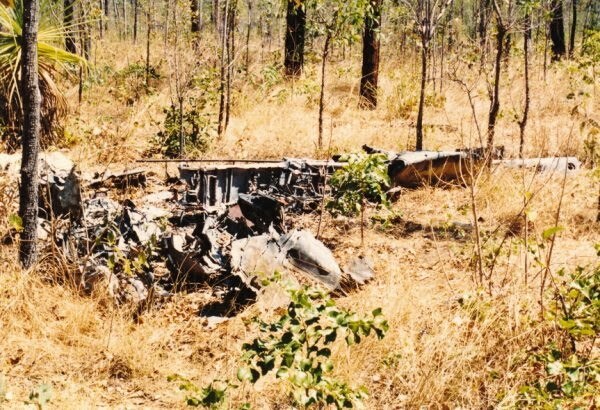 The encounter occurred at 27,000 feet about 10 miles north of Coomalie in North-Western Australia and was one of many in the defence of Darwin against the Japanese. The "Dinah" was being flown by the CO of the 70th, Captain Sasaki Shunji, 26 years old, with Lt Akira Eguti as his observer. 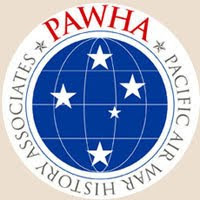 Both officers were killed, apparently attempting to bail out of the aircraft too low. 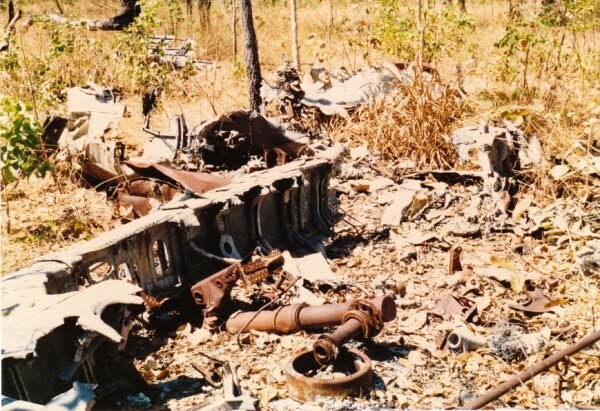 The wreckage of the aircraft was located by three officers of 457 Sqn and subsequently examined by FO Claude Pender, the Intelligence Officer of # 5 Fighter Sector, who submitted a report stating that the general appearance of the Ki-46 "was quite new, probably not having flown more than 30 hours." 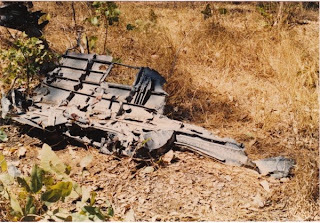 He also noted that the aircraft was "of grey painted metal, the tail assembly and ailerons were covered in grey fabric." 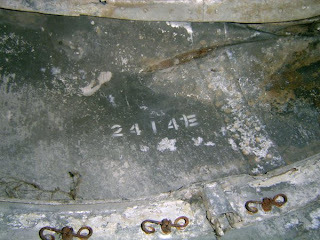 Dinah 2414 had been constructed in April, 1943, so at the time of the encounter was only three months old. In 1989 the wreckage of the aircraft, still in situ, was visited and examined by Bob Alford and Owen Veal. Owen matched the colour of the paint visible on the undersurface of the wing using Humbrol paints to the formula shown here. Unfortunately Humbrol 95 'Concrete' is no longer available but thanks to the good offices of Britmodeller (cheers John!) 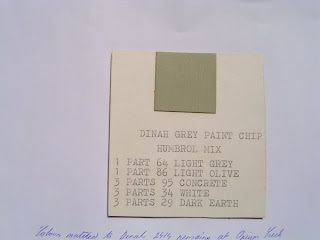 I was able to obtain a tin to replicate the mix precisely in order to examine and compare the matched colour across various paint colour standards. This colour also appears to be consistent with the "warm grey" appearance of the abandoned Ki-46-II in the colour photograph that heads this blog above. When an earlier Ki-46 of the same unit was shot down on 6th February 1943 by Wg Cdr Bob Foster of 54 Sqn RAF he described it in his combat report as "greyish blue". 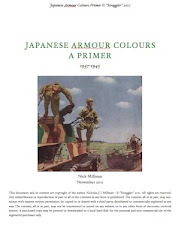 It is possible therefore that the grey paint had the same tendency to oxidise and "chalk" with exposure as the "olive grey" or "ash green" paint associated with the Mitsubishi Zero, shifting towards a more neutral or slightly bluish grey. 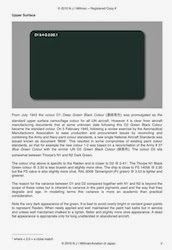 A previous blog post with comments about Ki-46 colours from contemporaneous observations can be found here. 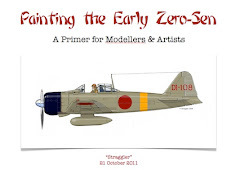 In comparison to readily available hobby paints the following observations were recorded. Tamiya XF-76 'Gray Green (IJN)' is slightly darker and greener but could provide a reasonable alternative match if lightened with a little white or light grey more towards grey. Lifecolor AU 071 'RLM 02 Grey' is too dark and too green. 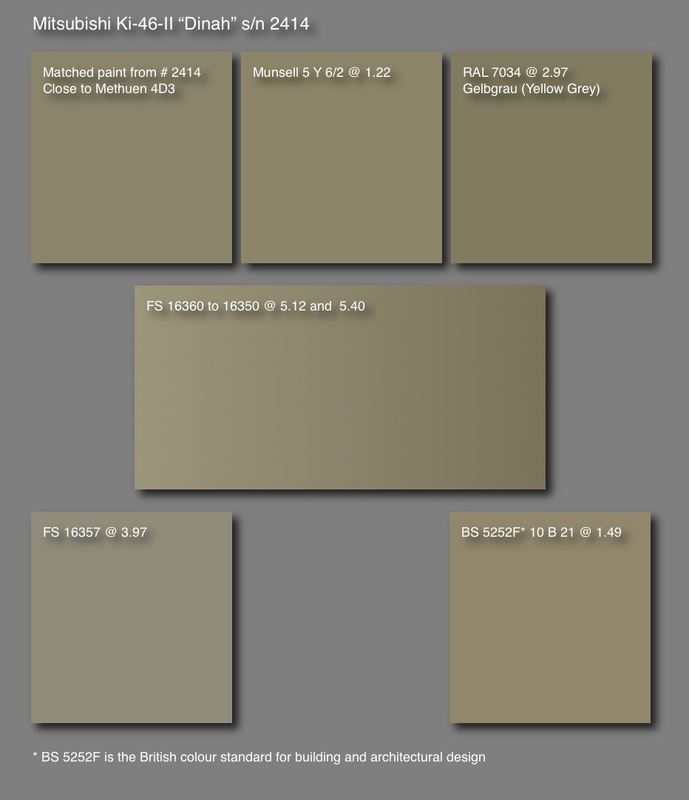 Vallejo Air 71023 'Camouflage Beige/Hemp' is too dark and too yellow/brown. 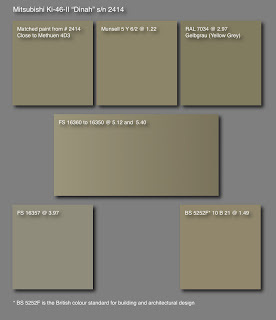 Polly Scale F414317 'Concrete' is close in hue but a little darker and too brown. White Ensign Models Colourcoats ACJ16 'Mitsubishi Zero Grey-Green' is a little too dark and still too brown. Gunze (GSI Creos) Aqueous Hobby Color H70 'RLM Grau 02' is similar in hue but just a little too dark and too much towards grey. Lighten with white and add a touch of yellow ochre. 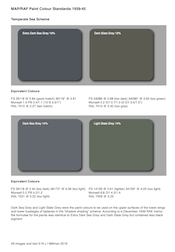 Testors Model Master 2071 'Grau RLM 02' is also similar but again just a little too dark and to much towards grey. Lighten with white and add a touch of yellow ochre; a trend emerges. The reality is that none of these paints straight from the bottle or tin are close enough representations of the colour. For those who wish to replicate it using Humbrol paints the discontinued # 95 'Concrete' may be substituted with 28 parts 103 'Cream' + 17 parts 34 'White' + 1 part 101 'Mid Green' , but this is suggested very much on an 80/20 basis and I have not tried it myself! The interior of 2414 was found to be a dark blue grey, described as being a colour somewhere between Humbrol's 67 'Tank Grey' and 79 'Blue-Grey'. This is a significant observation as it confirms that the interior of this particular aircraft was probably painted according to the prevailing JAAF regulations at the time of construction and provides a useful precedent for the interior colour of a type where it has not been known before. Curiously the interiors of the engine cowlings were also painted the same dark grey. The partial interior of the observer's station and interior of the engine cowling are shown below. The photographs below provide other views of the sad wreckage of this most elegant of reconnaissance twins where it has remained since 1943. With sincere thanks to Bob Alford for kindly sharing this information and the images. Wow, thank you! What a great info! Very interesting to see another proof of using Dark Blue-Gray as IJA Interior colour through mid of war. 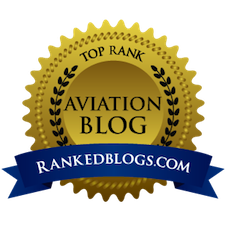 This post is nothing short of spectacular- thanks for sharing your hard work with us. Very interesting! Thanks to Mr. Alford and Mr. Millman for letting us see this. Dinah, like the Gekko, Seiran, Saiun, Ryusei, and Toryu, may suffer as a modeling subject from LSS - "Lone Survivor Syndrome" - whereby certain colors are decreed (especially interior shades) because the only one in the world *appeared* to have been painted as such (or, to be fair, might have definitely been). It's an admittedly compelling argument, but it's good to be reminded that it ain't necessarily so. As these photos and period reports of 2414's crash indicate, the well-documented and well-traveled Ki.46 survivor, with its pea-green cockpit, does not speak for every airframe. Some might say that this is a wreck and that it burned out, hence the color. But it doesn't look like that from the photos, especially the cowling interiors. I've sent you a number of emails the past couple of weeks and haven't received any reply. I don't know if you have received them. Your point is so well taken- without sites such as this one many would overlook "alternative" viewpoints that turn out to be very accurate.